This years fall fest went without any issues. The weather was warm and beautiful compared to last years rainy, windy, and cold. Though this year didn’t seem to have as many activity booth’s set up as last year. I’m hoping there will be more next year as there was a HUGE crowd that turned out. The red and blue things that are behind me in the photo is for laser tag, which is a set up by the Timberland Paintball. They opened a new location here in Bryant, Arkansas. 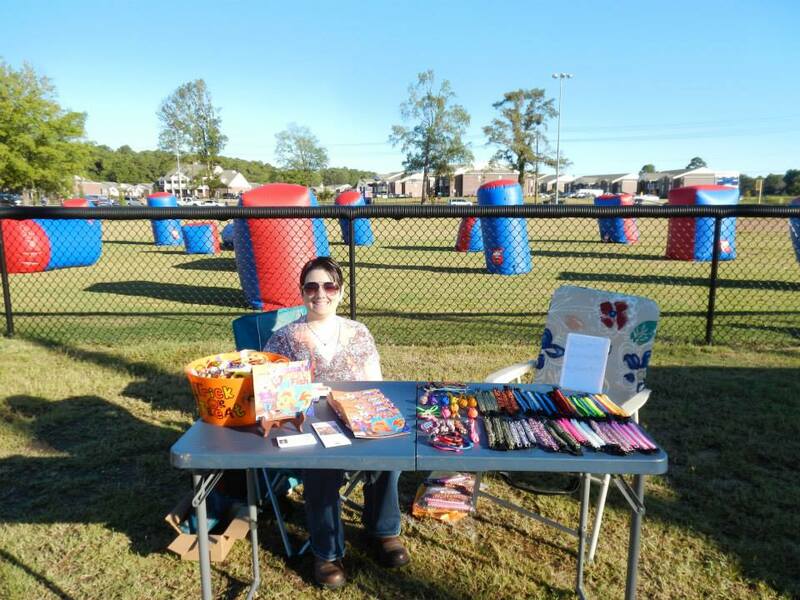 I had a booth set up, selling paracord bracelets and paracord keychains, as well as my children’s book Dana’s First Fish. 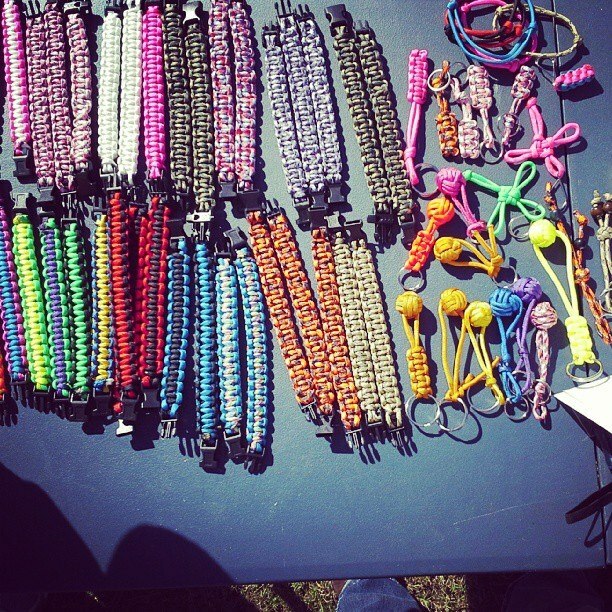 I am happy to say that I sold quite a few books and almost all of my bracelets. I know now to make more smaller bracelets than what I had, as they are more popular with the younger kids than they are with the teenagers and adults. Quite a few people placed special orders, as well as requested that I put them up on my facebook, selling them all year around. Doesn’t sound like a bad idea. Another thing I need to make sure I have next time is my canopy. I sat in direct sunlight, getting a nice sunburn. Actually, sunburns are not really nice at all as my chest is on fire, but you can get the meaning. I had not thought to bring sun screen, nor did I think to bring the canopy. The forecast said it was going to be cloudy. I’m not sure who typed that up, but there wasn’t a cloud in the sky. Still, I shouldn’t have forgotten the sunscreen, right? Though there were a few clouds and quite a bit of wind in the early morning, the sky was clear and the sun was hot from about ten AM on. I also wore a short sleeved v-neck shirt, receiving a sunburn on my arms, neck, and chest; my chest being the worse. In a few days it’ll look a little like a farmers tan. Another return to fall fest was the pumpkin bling contest. I had entered last year, as did my nephew Hunter, and my daughter. My daughter won first place last year in the children’s category and I had won second place in the adult category. 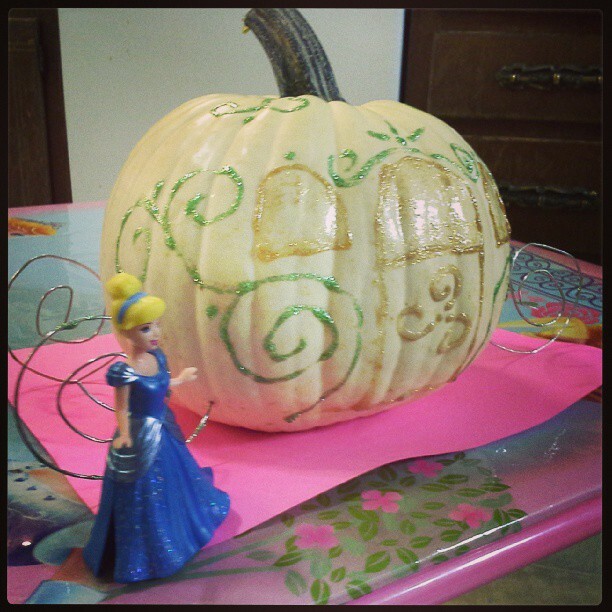 This year I made a Cinderella coach, winning third place in the adult category. My daughter made a black cat, but did not place, and my nephew made a pumpkin eating zombie, coming in second place. It was a tough competition this year as there were so many pumpkins that were beautifully decorated in all shapes, sizes, and colors. I am going to rethink next years pumpkin bling, as well as make a check list so as not to forget anything…like sunscreen and shade. I hope everybody is enjoying the first days of Autumn. Happy Monday everyone! This entry was posted in Blog, Crafts, Halloween and tagged Arkansas, author Jennifer N Adams, autumn, Bryant, children, children's books, Cinderella coach pumpkin, Dana's First Fish, fall, Fall Fest, family, Halloween, holidays, laser tag, paintball, paracord, paracord bracelets, parents, Pumpkin, Pumpkin Bling, pumpkins, single mom, single parents, Sunburn on September 23, 2013 by JenniferNAdams. I never knew pumpkins could have bling! Love that term. Sounds like a fun Fall Fest. Thank you! I headed to the store that night and got myself some aloe. I’ve been applying every other hour lol! Pumpkin bling is a new term I think. I didn’t know about until last year.